The differences between these two, and the setup of these, are outlined in more detail below. As an overview however, these both do the same function - which is combine multiple accounts into one line. You would consolidate accounts when the account types are the same (i.e. an expense code with an expense code) and the expenses are similar across the farms (i.e. Wages - Staff from Farm A and Staff - Wages from Farm B). On the other hand, you would create an inter-entity transfer when the account types are opposite (i.e. an expense code to an income code), an example would be if Farm A paid rent to Farm B. To consolidate accounts, head to the main page of your multi-entity group and select Consolidated accounts. You'll then be able presented with two options - find matches, or manually add consolidated accounts. Find matches will automatically suggest consolidation options based on accounts that share the same account codes in Xero. On the page that follows, you will be presented with a list of suggested consolidations and using the tick boxes provided you can mark whether you wish to proceed with the consolidation. Alternatively you can manually consolidate accounts by using Add consolidated account. 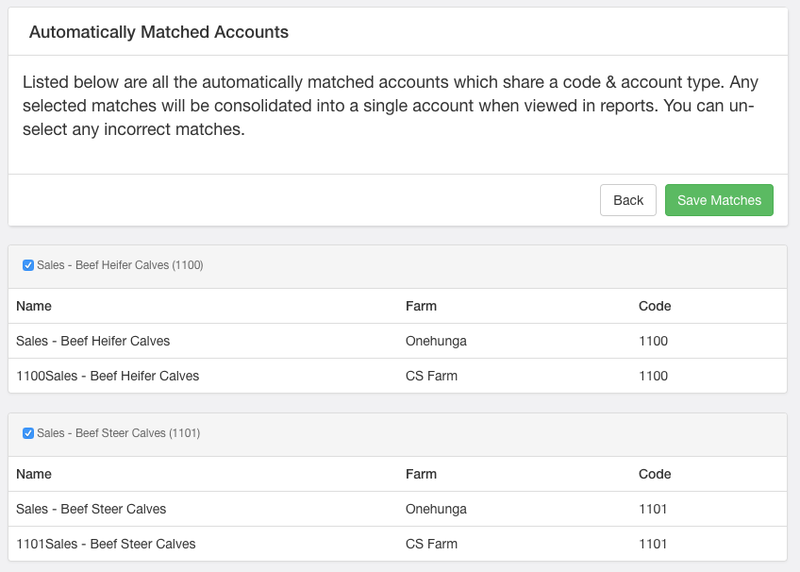 If you're manually consolidating the accounts, you first need to add some details about the accounts you're consolidating, and then you will be able to select the code(s) you wish to include from each farming entity. An inter-entity transfer can be added from the main page of your group, much like the consolidate accounts option. All you need is to select the from farm and account and the to farm and account. Please note, the order of these accounts is important. You will need to ensure that the to account is the income, otherwise if you have the expense as the to account it will give you a positive expense. This process is shown in the clip below.